From the kitchen of One Perfect Bite...This week's buttermilk extravaganza continues with a figure friendly dessert that will set your tongue tingling from the combined bite of lemon and buttermilk. You may even be able to claim this ice cream is good for you. Here's why. Cultured buttermilk is lower in fat and calories than regular milk because its fat has already been removed to make butter. It's also higher in potassium, vitamin B12 and calcium and it's more easily digestible than whole milk because of its lactic acid content. The best part of all this is that there are just 2.2 grams of fat in a cup of buttermilk. So, if you have to name your poison this is probably a good one to pick. Having said all that, it means nothing if it doesn't taste good. This tastes good and it's easy to make. I like to garnish it with candied lemon zest. While the zest adds gorgeous color and intensifies flavor, it's a nice, not necessary, addition. I think you'll love the simplicity of this ice cream. It's a decade old creation from Roxanne Gold. Take a look. 1) Place sugar in a medium-size bowl. Add zest and lemon juice to sugar. Mix well. Add buttermilk and salt. Stir until sugar dissolves. Chill for 4 hours or overnight. 2) Transfer to an ice cream mixer and freeze according to manufacturer's instructions. If not used immediately, transfer to a storage container and freeze. 1) Wash lemons thoroughly. Trim zest from lemons using a vegetable peeler. Cut wide strips, being careful not to cut into the white pith layer below. Cut zest strips lengthwise to create thin julienne strips. 2) Place julienne strips in a small sauce pan and cover with cold water. Cook over medium heat until water comes to a simmer. Continue to simmer for 6 minutes. 3) Remove from heat, drain strips and then return them to sauce pan. Add water and 2/3 cup sugar. Bring mixture to a simmer. Continue to cook over low heat until lemon strips turn translucent. Sugar water will begin to thicken. Cooking time will be approximately 10 to 15 minutes. 4) When done cooking, remove strips from the pan and spread out on a sheet of wax paper. Separate strips on wax paper so they are not in clumps. Cool slightly. Roll in additional granulated sugar to coat. Yield: 8 servings. For the moment I only eat diet-ice ... but this looks so delicious ! I've never had buttermilk in an ice cream before. This looks so good and cooling. Anything....ANYthing with citrus is perfect for me. This looks absolutely luscious Mary. I love to candy citrus zests. Grapefruit is especially good. The ice cream looks wonderful and just in time for summer! Oh my gosh, that's completely gorgeous! Perfect summery treat! When I was viewing the wonderful photos on foodgwaker this morning, I was not surprised that this one was your! Looks wonderful, Yum. Your posts and photos are always wonderful. Looks good and feel a bit cold here in the hot weather Malaysia! Ive always wanted to try my hand at making candied lemon zest - looks great! I haven't made ice cream using buttermilk. I'm sure it's a great combo with the lemon! Yummy we need some down here with the heat index at 103!! Ooh! I have been thinking of making some homemade ice cream. These flavors sounds perfect! Very nice! Yum! 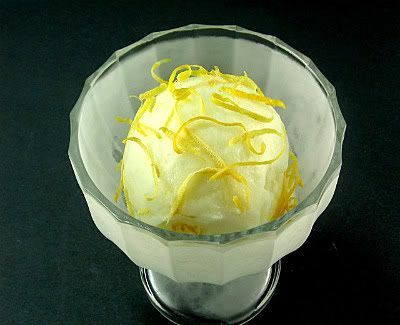 I made a lemon frogurt this weekend but have never thought of doing buttermilk as a base - so creative! So refreshing! Buttermilk is a staple in this household. Sounds wonderful. Thank you for stopping by my blog and leaving a lovely comment. If the weather only improved that I'd be game for this refreshing treat. Buttermilk is so undervalued, mostly because people think it's fattening when it's not! Love this summer treat and the candied zest makes it look so pretty. Looks and sounds perfect as usual. Thanks for sharing such a great recipe. It sounds cool and refreshing. Besides that, it is pretty to look at. Oh My! I know where I'll be gettin' recipes for now on. I love lemon and I Love cheese and I LOVE buttermilk! Thanks for the kind words - it's always nice to make new friends. Thanks for stopping by to visit and your sweet comment. I hope you get to travel to somewhere soon. That looks amazing. My mouth is puckering just thinking about the lemons. wow this ice cream sounds delicious! i want some asap! What a perfect ending to a meal! I can't wait to try this recipe!! Your ice cream is a perfect treat. Mary, I didn't think your photos could get any better but I was wrong. Every photo is better than the next. Are you starting a new career? A PROFESSIONAL PHOTOGRAPHER!! Have a great weekend. Another good use for lemon zest! It's one of my favorite ingredients. I just love baking with buttermilk, I can't wait to try it in homemade ice cream. Yum!!! I'd gladly name this for my poison mary. I love buttermilk in ice cream. Oooh, I'm going to have to make this one! I bet it tastes like a cross between ice cream and sherbert, and super refreshing for summer to boot. Thanks again. I made this tonight, super good, but a bit too sweet. I think if I make it again I would decrease the sugar to 1 3/4 cup. Such a great way to spend a summer evening!